Bangladesh, Sep 8 2017 - IOM, the UN Migration Agency, today (8/9) confirmed that 270,000 people have fled violence in Myanmar to seek safety in Bangladesh since 25 August. IOM, which yesterday allocated USD 1 million from its emergency funds to boost the humanitarian response in Cox’s Bazar, is working with the government and partners to scale up its delivery of lifesaving aid to those most in need. Immediate priorities have been identified as shelter, drinking water, food and medical assistance. The UN Central Emergency Response Fund yesterday also announced a further USD 7 million to help the thousands of destitute people who continue to flood into Bangladesh. “I came here three days back along with my husband and four children. It took us six days to walk here, and we had very little to eat. I couldn’t bring anything with me. Even the clothes we had with us, we lost on the way. We now desperately need food and shelter. We need materials to cook with and a place to wash. We haven’t been able to get anything yet, except this meal today,” said Najuma Begum, speaking to IOM staff collecting needs data at a food distribution centre near the Kutupalong makeshift settlement. While Najuma’s family managed to get a ready cooked meal at the food distribution centre, many people have now set up camp in areas which are too far from established support centres to receive help. Most families are living in the open, in the rain, with children and the elderly at particularly high risk of getting sick. The number of new arrivals has increased considerably in part due to the joint needs assessment carried out on 6 September, when inter-agency teams visited more host community locations. Arrivals identified in previously unvisited host community settings tally 75,000 in 9 locations visited. At the same time, arrival numbers in the previously known makeshift locations also continue to increase, and over 10,000 are staying in Teknaf Municipality area. An estimated 130,000 of the new arrivals are now living in the registered refugee camps and three makeshift settlements of Kutupalong, Leda and Balukhali. Another estimated 90,000 people are sheltering in host communities, and nearly 50,000 have settled in new spontaneous settlements which are expanding quickly with people still searching for space to make temporary shelters. Safety has been a major concern for the new arrivals, especially girls. “I’ve two young daughters with me and I fear for their safety. We have no latrines and we’re scared at night to go out into the fields (to defecate). We go in groups if we have to,” said Ajumar Begum, who is sheltering near the Balukhali makeshift settlement. Healthcare facilities are also struggling to provide adequate services as the number of people in need of emergency and basic health care continue to grow. Seven mobile health teams have been deployed to the spontaneous settlement areas, and IOM and partners are recruiting more doctors, nurses and midwives to increase the reach of the teams. People are too scared and exhausted to travel long distances to seek health care, so it is imperative that it as close to the settlements as possible. There are also a number of pregnant and lactating women among the new arrivals. Eight months pregnant Halima Khanam in Balukhali is expecting her first child. “I have been here three days with my mother and younger brother. I’m scared. I don’t know where my husband is. We are depending on the family we’re living with here. I don’t know how long we can survive,” she told an IOM staffer. According to the Inter Sector Coordination Group (ISCG) in Cox’s Bazar, which is convened by IOM, the number of new arrivals continues to increase (http://cxbcoordination.org). 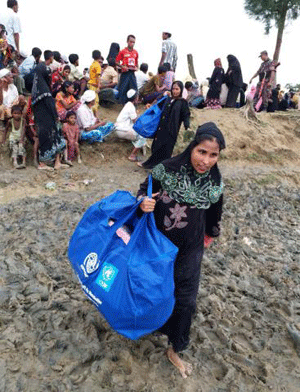 On Wednesday (6/9) there was a sharp increase in arrivals as at least 300 boats arrived in Cox’s Bazar from Myanmar. Sea routes are particularly dangerous at this time of year, when boats are known to frequently capsize in rough seas. New arrivals usually start by looking for space in the established makeshift settlements, where there are some services. But these are already full to capacity in terms of space. As a result, three new spontaneous settlements have sprung up in areas which still have very little by way of services. “Humanitarian agencies are deploying mobile medical teams, installing emergency latrines, providing water, and are distributing tarpaulins for basic shelter and food rations to new arrivals. But much more is needed and we are fast running out of stock,” said ISCG coordinator Margo Baars. To date, IOM has distributed 6,957 plastic tarpaulins (with 3,479 kgs of ropes), 300 sleeping mats, and 600 non-food item kits containing essentials such as cooking sets, clothes, bedding and mosquito nets, to the new arrivals. Before the latest influx, IOM Bangladesh was coordinating humanitarian assistance to some 200,000 Undocumented Myanmar Nationals living in makeshift settlements in Cox’s Bazar. Lifesaving services delivered by IOM and its partner agencies include clean water and sanitation, shelter, food security, health care, education, and psychosocial support for the most vulnerable individuals, many of whom are suffering from acute mental trauma or are survivors of sexual violence. Most of the people now crossing the border are women, children and the elderly, many of whom are vulnerable and lack the ability to take care of themselves. For more information, please contact Peppi Siddiq at IOM Bangladesh. Email: pksiddiq@iom.int, Tel. +8801755568894.